Where building a recording studio used to require hundreds of thousands of dollars in equipment, now it takes only a computer, a microphone and some choice software to turn any home PC into a full recording studio. 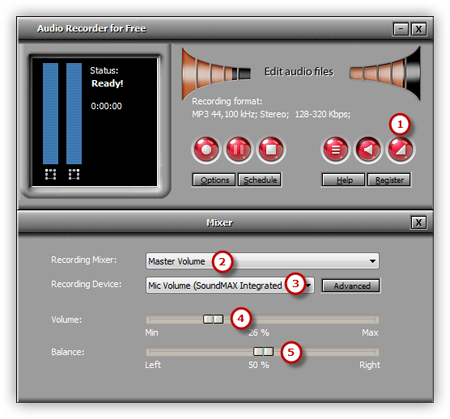 Audio Recorder for Free lets you to record from mic and directly output as audio files. Launch Audio Recorder for Free. Click “Show Mixer Window” button to select the sound card in your system and choose “Mic Volume” as sound source. You can adjust the Volume & Balance. Click “Options” and a window will be activated. In “General Settings” area, you can specify an output format among MP3, WAV, WMA and OGG. Click “Settings” to adjust the recording quality by well-configured presets or configuration parameters. Click “Change” to select an output folder. It also has the ability to name the recorded file automatically by date and time. Other settings like AGC, VAS, Hot Key and Schedule are also available. After everything is set, just play any sound or speak over the Mic that you want to record. Then you can see wave variations in the wave pattern. If the volume is too low, you can see only very small variations in the wave pattern. If the sound is being clipped off because the volume is too high, move the volume setting down until most of the volume range is displayed without clipping. 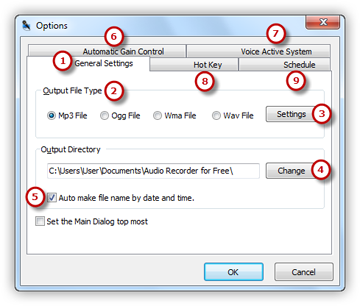 Click the red round record button in Audio Recorder for Free or press the hotkey you just set to start recording. 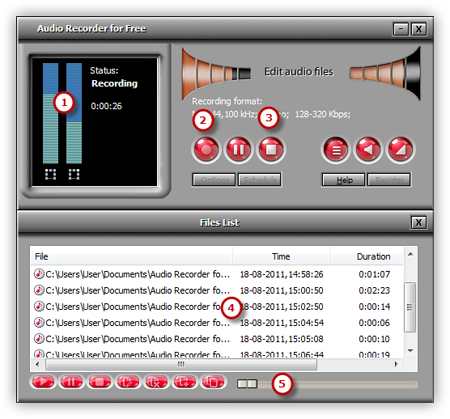 To stop the recording, click “Stop Recording” and the recorded sound will be directly output to the output folder & listed in the file list with detailed information like filename, location, time, duration & size. You can play the recording with the built-in player.